Welcome to Alabama Land Surveying, for a Land Surveyor in Clanton, Montgomery, Prattville, Millbrook, Hope Hull, Pike Road, or Wetumpka. Alabama Land Surveying services in the following couties: Autauga, Elmore, Chilton, Lowndes, Montgomery or surrounding Counties. Alabama Land Surveying is a web site dedicated to help, you, the Property Owner better understand how an Alabama Land Surveyor performs his work, along with some of the different types of surveys. Our surveyors have been involved in the Land Surveying Industry for over 30+ years of land surveying. This acquired knowledge, insight and ability isn’t something you learn in a book or class, but gained thru years of experience of dealing with a lot of different, adverse and varied surveying situations. 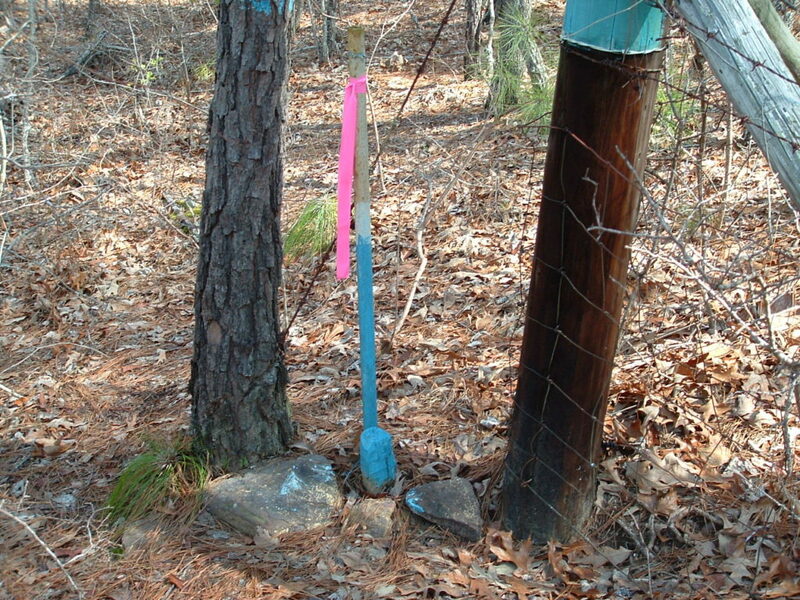 If you need help with property issues or need a Land Surveyor, hire a competent, licensed Alabama Land Surveyor. Call us at 334-826-9540 or fill out our Contact Form. Understanding Old Surveys isn't something you can learn overnight and sometimes takes years to perfect. Maybe this will help you in Understanding Old Surveys, shown below is a copy of an Old Survey, the NW and SW corner are shown as being existing irons. Can you pick the 2 existing irons out of the pictures shown below? Understanding Old Surveys and old deeds is an important key to finding old corners. If you don`t understand you may never find that existing iron. IF YOU PICKED THESE 2 YOU ARE CORRECT. Not the kind of existing iron you would expect to find, no iron ore in these 2 existing irons, all wood here. You really wouldn’t expect this one to be a corner, both corners verified by adjoining property owner. It appears to be a cherry knot. If you need help finding your TRUE property corners, hire a competent, licensed Alabama Land Surveyor, Glen Tanner @ Glen Tanner Land Surveying has been surveying in the Montgomery, Autauga, Elmore and surrounding Counties for over 30 years. Call us at 334-625-8175 or fill out our Contact Form. 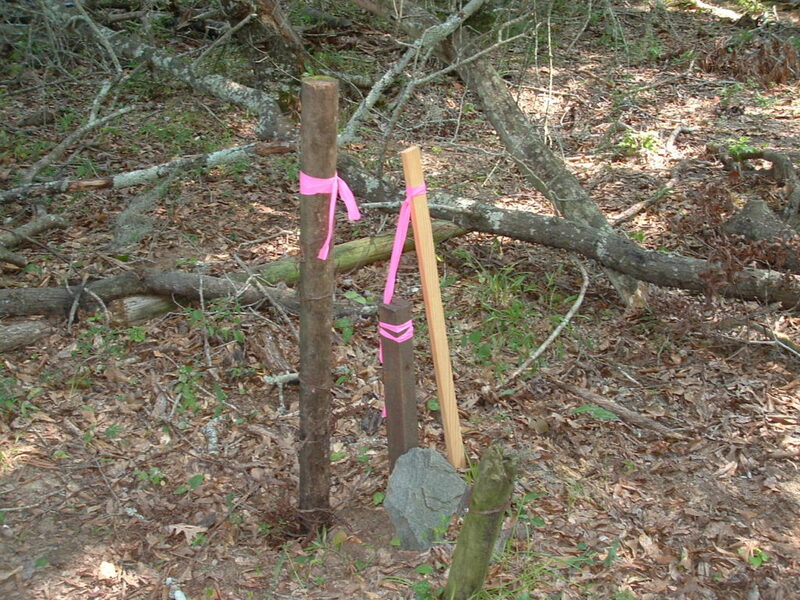 Too many of the public are blindly relying on recorded plats and the word of the existing Property Owner or Realtor,as to the location of the property.Some rely on the word of the Builders site plan, many rely on a copy of the recorded lot given to them by a Closing Attorney or use an old survey without checking existing monuments by getting an up to date survey or have a land surveyor recheck and verify existing Property Corners against the recorded plat or deed. Another common problem is accepting monumentation on a survey that may be in conflict with existing monumentation on the ground. Here are some examples. 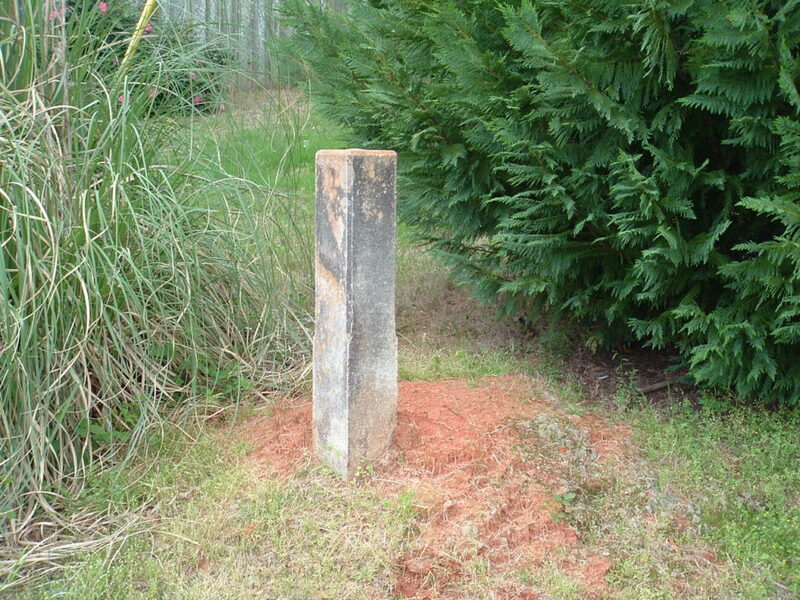 County acquired deeded Right-Of-Way from the public and marked it with concrete monuments. 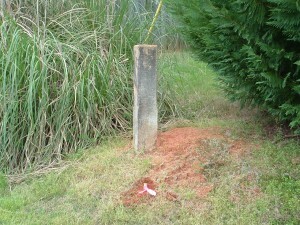 ALL Right-Of-Way points were marked on the ground with concrete monuments. A survey was done, instead of using Right-of way as monumented, this survey was determined by shooting centerline of road and was calculated based on centerline shots. Capped iron pins were set based on the centerline of road. 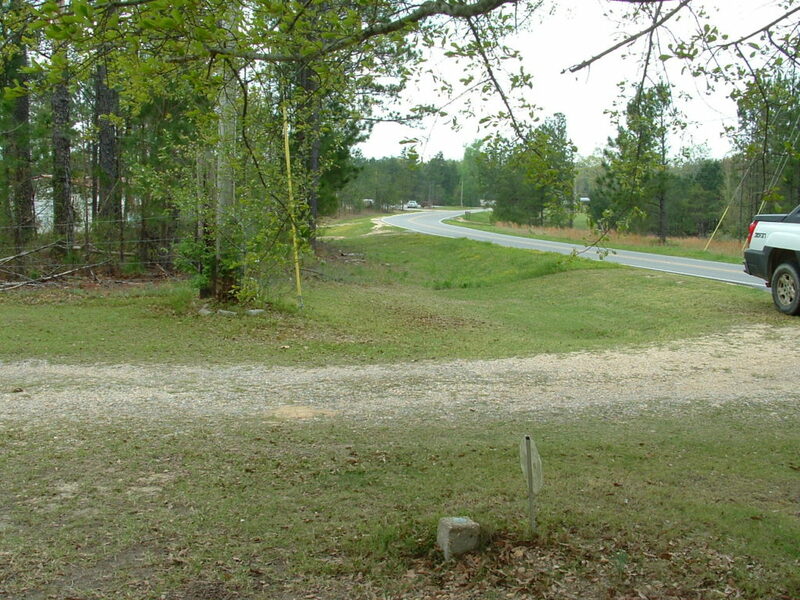 This method might be fine in the case of a prescriptive Right-Of-Way, but in this case the Property Corner bordered a dedicated County road. 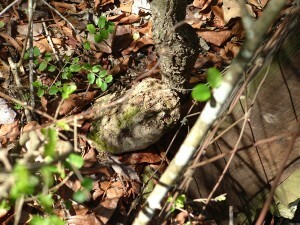 ALL Right-Of-Way points were marked on the ground with concrete monuments. 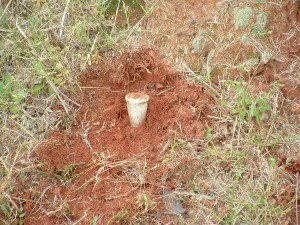 This capped rebar was set in right-of-way some 2 feet in deeded, monumented County Right-Of-Way. None of this was shown on the recorded plat. 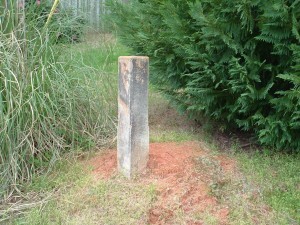 Who owns the property between the "Concrete Monument" and the "Capped Rebar"? 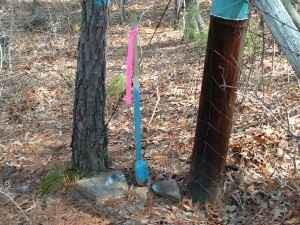 Does the property owner own to the "Capped Rebar" even if it matches the recorded plat? Others ignored the monuments and continued the errors. Does the property owner have clear title to all his property? Are the Property Corners correct as they are located on the ground? Another Example, a company surveyed a 2-acre parcel of land, which had been reported in yards. 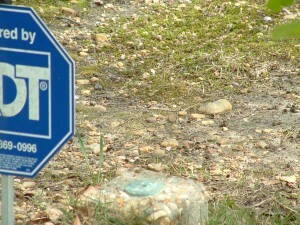 In 1954 the County acquired right-of-way off of the 2-acres and was marked on the ground with concrete markers . The deed wasn’t revised at that time. The Company surveyed the 2 acre parcel and wrote a new legal and a new deed prepared, just one problem, it did not exclude the deeded and monumented right-of-way acquired by the County. 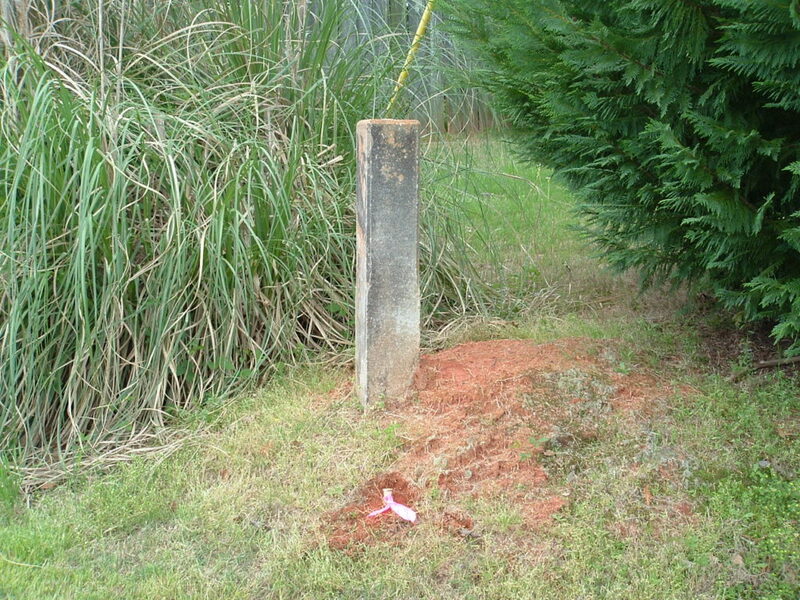 Not only that, the Company made the property line straight along the County Right-Of-Way, as the deed called for, disregarding the 6-inch by 6-inch concrete monument sticking up 5 inches out of the ground and next to the drive way and the large curve appearing in the pavement. 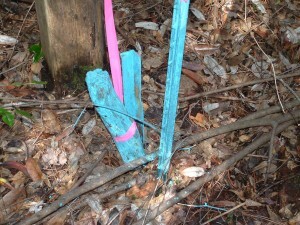 By doing this the property line is now located in what the County is calls the "County Right-Of-Way". 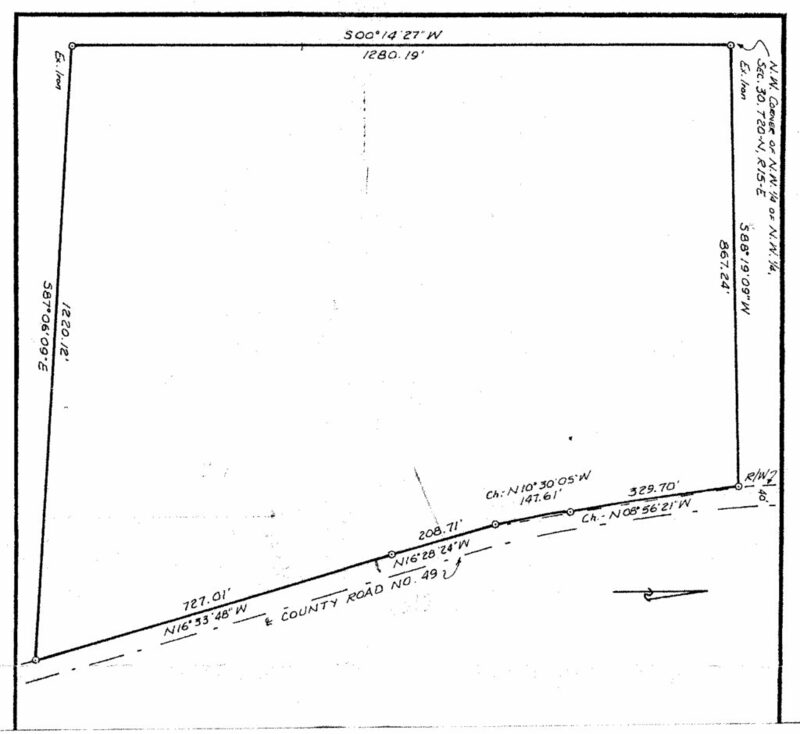 Even though the original deed called for a straight line and the County put a curve in the property line, does the property owner still own it as called for in both the old and new deed? 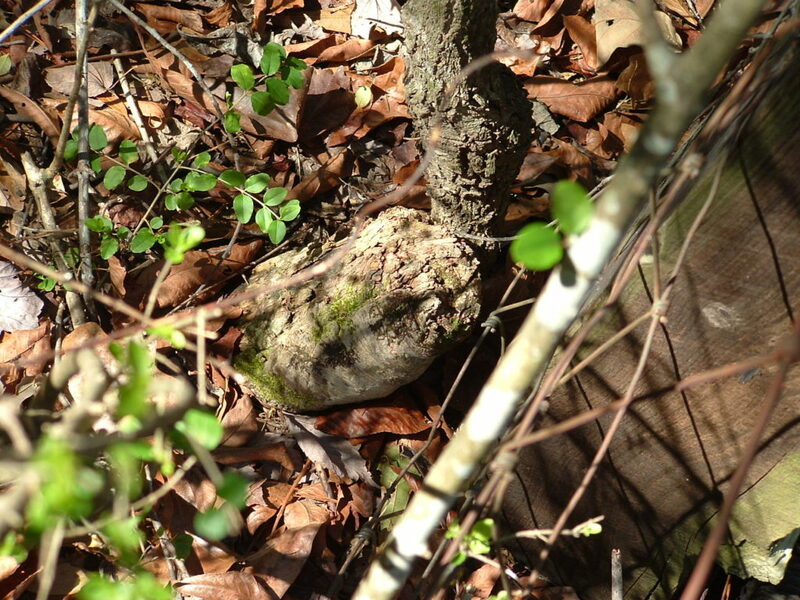 In both of these cases, whether the monuments were not found, were not looked for, or just plain ignored does not change the fact that the County acquired deeded right-of-way. In both cases even though the property owner has a deed, copy of a recorded plat or even an old survey showing ownership, the property owner DOES NOT OWN the property within the County deeded right-of-way, even if there is a marked Property Corner. The property owner CAN NOT lay claim to it by adverse possession, you can not claim adverse possession against the County. So in both cases the property line moves back to the deeded and monumented Right-Of-Way. Not sure where your corners belong or you need help finding your actual property corners, hire a competent, licensed land surveyor. Glen Tanner @ Glen Tanner Land Surveying has been surveying in the Montgomery, Prattville, Elmore County area for over 30 years. Call us at 334-625-8175 or fill out our Contact Form. The art of finding property corners is being lost. The following picture shows what inspired the following. The two rebars, a #4 rebar and a #5 rebar, shown in photo are 1.9 feet apart and set in 1994 and after according to the client. Did we not have MTS and magnetic locators or at least an aqua locator in 1994? How many of you had your crew come in and the party chief tells you that they had to set an iron because they couldn’t find an iron pin? How many of you accept this or do you check it out yourself? There is a lot of iron ore in the rocks around these two rebar, which will mess with magnetic locators if your not patient. 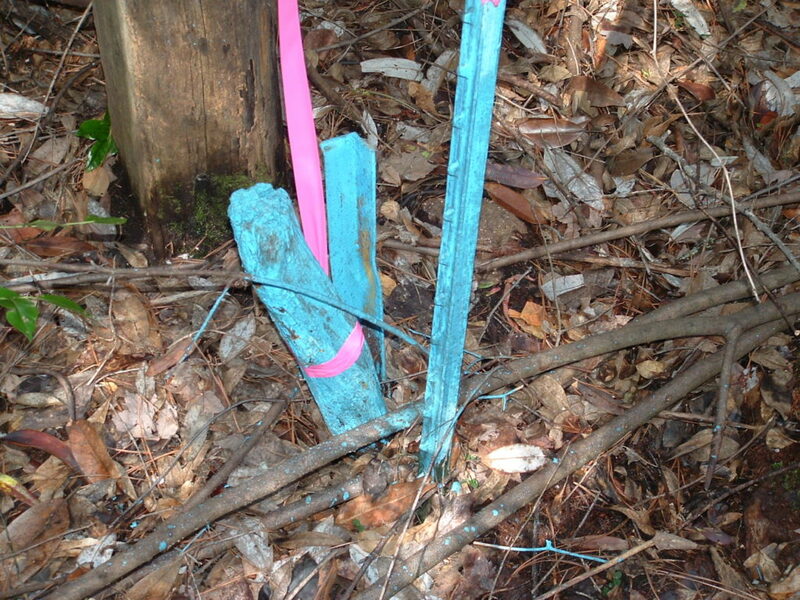 Any time I go into an old subdivision, pre-1980-85, before surveyors started using rebar and see capped rebars at corners where galvanized iron pins, solid bars or old irons should be, I always ask myself how hard did the surveyor look before setting the corner. 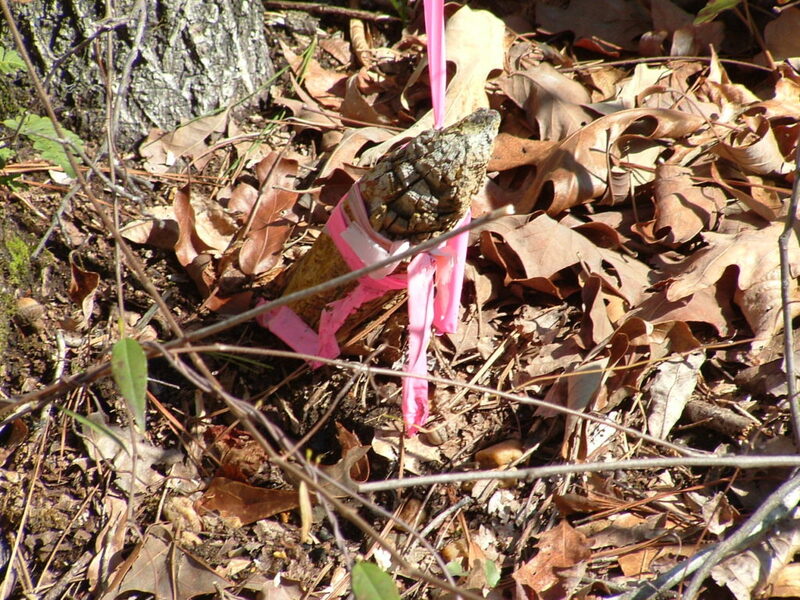 Setting a new pin Increases the land surveyors liability. In old neighborhoods, especially those that go up and down steep inclines, very seldom do the irons on the ground match the recorded plat or deed, in angle or in distance, and if you try to use a pre-set data collector and a total station, 9 out of 10 times you will not find all the property corners – not because they're missing, but because you're probably in the wrong place or were not looking hard enough. We should always remember that in old subdivisions and old boundary surveys, surveyors used plumb bobs, chain, theodolite, and no one knows what the closure of the survey may have been, if it even had one. Almost all survey crews have a magnetic pin finder and either a bushaxe or machette. As a Professional land surveyor I use the items shown in this picture. Without these tools how do you expect your crews to locate property corners if they can't even dig them up? The magnetic locator in this picture is about 17 years old. It is held together with JB weld and duck tape. The reason I don’t buy a new one is because new isn’t always better, when it groans I understand why, when it screams I know why, most of all I have had very good luck with it finding corners. I have always used an aqua locator, the black box in picture, near fences or when I doubt what the magnetic locator is doing, an aqua locator works as deep as 2 feet. I go thru a sharp shooter a year, the pick is for hard ground, the post hole diggers are for when the sharp shooter doesn’t work getting out the dirt. The next question is how low will you go to find a property corner, in other words how deep will you dig before you give up and set a property corner? How many of you or your crew would quit here thinking it’s garbage or keep digging? One open-top iron pipe found. How deep does your crew dig to find a property corner? I personally go until I’m absolutely sure. The deepest I have ever had to dig to locate an iron is 3 feet. I have found old irons that a tree has grown over or around as much as a foot in the tree. This lot was a 100 by 200 according to the plat, but on the ground along the road it measured 98 feet, along the rear of lot, 96 feet and 198 feet in depth. Boy, this one sure matched the plat. This lot originally was an Autauga county gully that has been filled. The plat was recorded in 1969 and all lots shown on the plat along the south line were shown to be 160 feet plus or minus. Do you believe the rest of the subdivision is going to match the plat? Due to technology, lack of skill and training, or proper time and effort by land surveyors and survey crews to locate or find property corners in old subdivisions, more and more corners are being set instead of being found. I have always believed it is better to find an original corner than to set a new corner. Ask anyone that knows me, they will tell you, before Glen Tanner quits looking and sets an iron, the ground will look like it has been attacked by armadillos and groundhogs. The art and skill of finding property corners is disappearing. 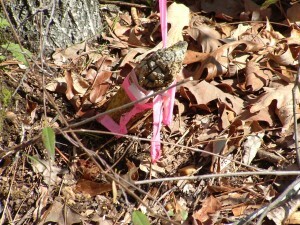 We as surveyors need to teach and emphasize the need to look for and locate property corners. I find about 90% of property corners in old subdivisions. It isn’t always easy and some of the time it is very time consuming. 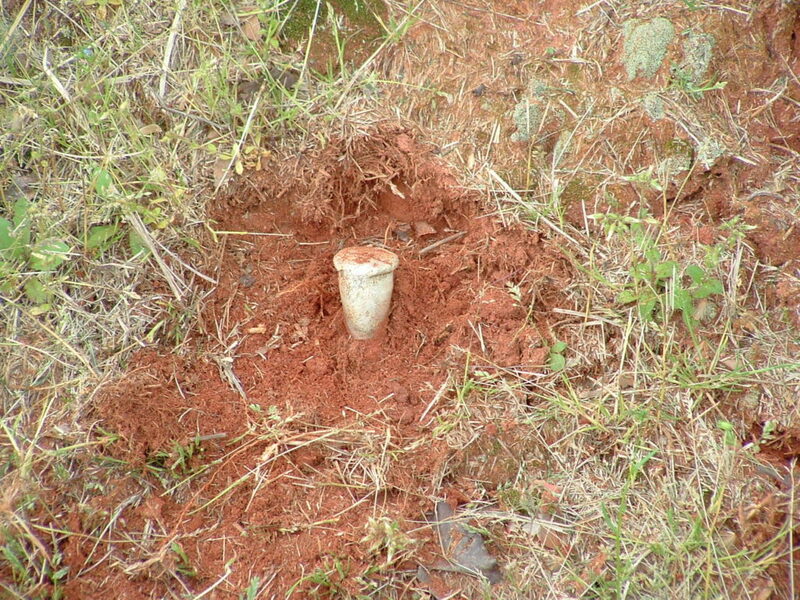 I have been known to go back on a different day, after having had time to look at my field data, and start fresh with an better idea on where to look before setting an iron pin. It does work but it takes time, it is something we don’t allow ourselves or allow our survey crews – time to look. Isn’t our duty as land surveyors to follow in the foot steps of the original land surveyor as close as possible, not to re-interpret or move to where it calculates. Many of you are going to say that your clients aren’t going to pay for it or I didn’t allow that much time in the job to be going back. Isn`t it our job? Isn't it required by the Standards of Practice? Isn’t it our ethical duty to protect the public and to do these things regardless of what the client is willing to pay or how much time we have allowed in the job? The art to finding old irons is to listen to property owners, who know the area, or how it was surveyed, but most of all taking the time to look and dig. That's right – dig – a lot. My magnetic locator doesn't have a brain, it didn’t go to school, it doesn’t speak English, Spanish or French – But, it will lie to you. Learn to understand your equipment, something that may take months, even a year or two. Understanding the squeaks and squalls of the magnetic locator signal being sent to the user is important. Remember be patient, learn what what to look for and most of all – dig, dig, dig. THIS is the art of locating old property corners. Not sure where your corners are located or you need help finding your actual property corners, hire a competent, licensed land surveyor. Glen Tanner @ Glen Tanner Land Surveying has been surveying in the Montgomery, Prattville, Elmore County area for over 30 years. Call us at 334-625-8175 or fill out our Contact Form.